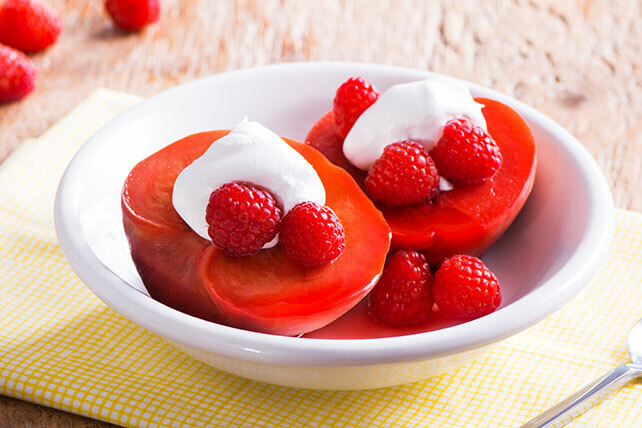 Replace peach pits with fresh berries and COOL WHIP for Blushing Peach Melba Dessert. A blushing peach treat makes for an easy and elegant dessert. Mix dry gelatin mix, apple juice and water in Dutch oven. Bring to boil on medium-high heat. Cook until gelatin is completely dissolved, stirring frequently. Add peaches; cover pan with lid. Reduce heat to medium-low; simmer 15 to 20 min. or just until peaches are tender. Remove peaches from liquid; discard liquid. Serve peaches warm or cover and refrigerate until ready to serve. Top with the raspberries and whipped topping. Substitute nectarines for the peaches and sliced strawberries for the raspberries. Makes 4 servings, 2 peach halves, 1/4 cup raspberries and 2 Tbsp. whipped topping each.